This is WOW News 247: Finally Gambia's President Jammeh Steps Down: To Flee to Mauritania On Exile! Finally Gambia's President Jammeh Steps Down: To Flee to Mauritania On Exile! 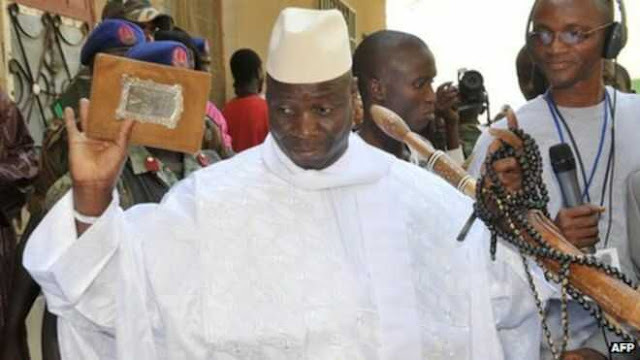 According to multiple inside sources from Gambia's capital of Banjul, strong-hearted Gambia's President Yahya Jammeh whose presidential term expired some hours ago after loosing to opposition candidate Barrow, has finally agreed to leave office after so much pressure was mounted on him by the President of Mauritania, Mohamed Ould Abdel Aziz who visited him some hours ago to have a close door meeting with him to convince him to relinquish power to opposition winner. Recall that Yahya Jammeh had vowed to cling to power after accusing the country’s electoral commission of rigging the election in favour of the opposition.